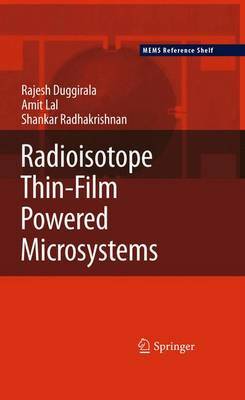 "Radioisotope Thin-Film Powered Microsystems" describes high energy density microbatteries required for compact long lifetime wireless sensor Microsystems. These microbatteries are presented alongside theories employing high energy density radioisotope thin films in actuating novel electromechanical energy converters. Also discussed are novel wireless sensor architectures that enable long lifetime wireless sensors Microsystems with minimal amounts of radioisotope fuel used. Ultra low-power beta radiation counting clocks are described in order to illustrate the application of radioisotope thin films in realizing the deployment of various components of Microsystems. "Radioisotope Thin-Film Powered Microsystems" also presents the latest work on 3D silicon electrovoltaic converters and energy density microbatteries required for high-power Microsystems.